The engine that produced massive small-balance loan originations of $230 billion last year is losing some steam. The $50.6 billion of new loans generated during Q1 cannot be ignored for its heft, but a recent softening trend is not inconsequential either. 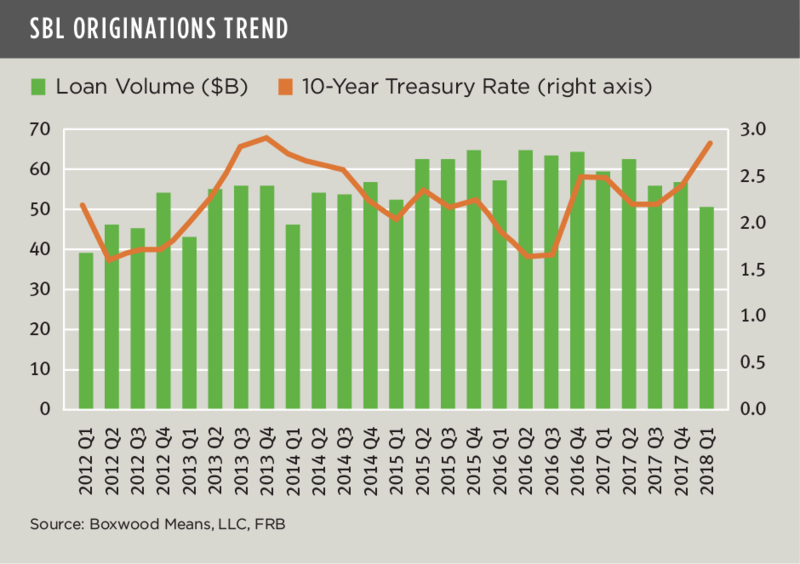 Total quarterly origination volume was the lowest in four years and receded by 9.7% sequentially and 14.4% YoY. See the nearby graph. This slowing SBL trend is consistent, albeit less severe than the quarterly and YoY declines of 34% and 23%, respectively, in aggregate commercial mortgage originations among commercial banks as reported by the Mortgage Bankers Association. The deceleration in SBL volume may reflect shifting investment dynamics that are a drag on finance activity in the space. While refinance loans declined by only 5.6% YoY, purchase loans were down a sizable 25.6% -- but not as a result of waning property sales transactions. In fact, Boxwood’s research indicates that small-cap CRE sales under $5 million actually rose modestly by 3.7% during the first three months of the year. Moreover, the pullback in acquisition loans is not simply a case of migration above the dollar threshold, i.e., that rising asset prices reduced the overall pool of modest-sized transactions. Instead, it appears that small-time investors and private funds may be doing more cash deals as rising interest rates of late have increased borrower costs (see the treasury rate trend in the graph). Also, lenders must contend with a shift in loan originations from primary to secondary and tertiary markets. Our research indicates that the top 15 U.S. counties accounted for 27.9% of total volume during Q1, down 14.9% YoY as loan production in the balance of counties jumped 81.2% from the first quarter of last year. This latter shift reflects the reappearance of strong credits and property fundamentals in smaller markets throughout the country. As we cited in a previous blog, the market’s strength is epitomized by the 7.7% annual gain in Boxwood’s national Small Commercial Price Index (SCPI) during April that is the highest annual return on record. The market’s overall vigor is good news for national, regional and community bank and non-bank lenders alike, but especially national lenders that can nimbly adjust to the ebb and flow of originations in diverse markets across the country. That being said, major SBL lenders continue to feel the competitive heat: the top 15 lenders commanded just 18.0% of the total market in the quarter, down 34 basis points from the same period in 2017. Nevertheless, for loans under $1 million, the top lenders held their sway with a 14.5% market share that marginally increased by two basis points YoY. Late into the market’s expansion, it behooves SBL players to even more carefully watch their competition and choose geographical markets wisely.